Any woman who writes a soundtrack to her own imaginary tale about an adventurous muse she met in Joshua Tree over 100 years ago, has us deeply intrigued. Miwa Gemini, musician and mother to 1 1/2-year old Jarvis, is one such artist. Engimatic, magical, and introspective, Miwa has cracked the modern motherhood code—staying true to herself and her craft while thriving as a wife and mother. This mindful mom, who is most nervous about doing it all wrong, is actually doing it all absolutely right. and how it shaped who you are today? I grew up in Japan with a younger brother and my mother and my father. My mother is a working mom, and she definitely influenced me quite a bit as a human being. She was busy but I felt like she gave me everything I needed. 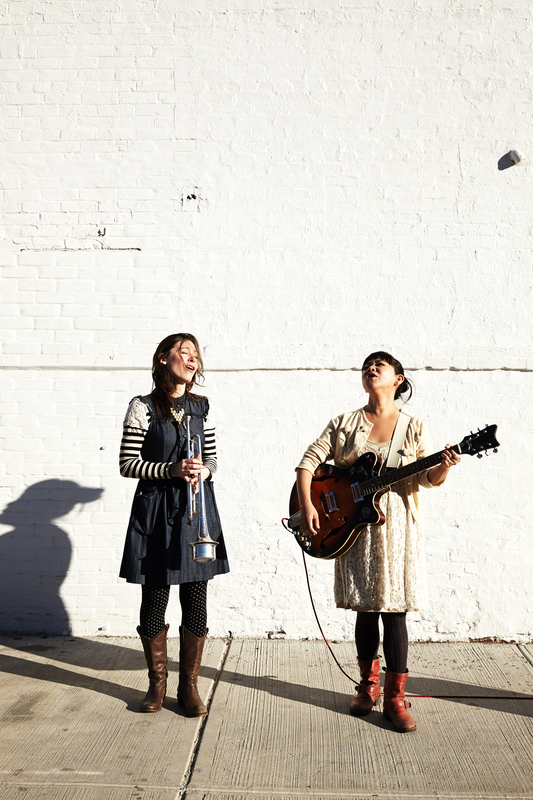 Miwa and her good friend and creative partner Rebecca harmonizing for Miwa Gemini. I always felt that I didn’t belong in Japan and I couldn’t wait to leave. I came to America as an exchange student when I was 16 for just one school year, and then I went back to finish Japanese high school. Then I got into NYU and I’ve never left. I would say gypsy-folk. There’s a little bit of jazz going on, and there’s folk music going on. There’s also a 60s influence, definitely a 60s girl-pop influence. Miwa Gemini is my solo project, but I collaborate with different musicians. I call it musical chairs. Guitar is my main instrument, but I’m also a classically trained pianist. And I write all of my own music and lyrics. I’m also part of Main Squeeze Orchestra, which is an all-female accordion orchestra that covers a broad range of music. I find inspiration everywhere—music, museums, walks. I have this ritual that I haven’t really been able to do since Jarvis was born, but I make two cups of tea, one for me and then one for my creative muse. It feels nice to have a writing partner, even if it’s just in my head. I always wanted to be a singer ever since I was little. I was obsessed with Billie Holiday when I was 13. I didn’t understand her music, but I just wanted to be her. It was my dream to go to New York, but once I got here, I just didn’t have the confidence that I could be a front woman, so I joined various bands and played different instruments. It took me a really long time to realize that I just wanted to do my own music. What effect did having children have on your music? Creatively, I let go of my inhibitions. I’m less judgmental of myself. But the biggest challenge has been not being able to have some quiet time. That’s the bit that I’m struggling with. I have time to practice, because sometimes I can just strum a guitar and sing with Jarvis and that’s not a problem, but not being able to have sit-down time to create. Sharing the music and being on the stage. It’s just such a wonderful feeling when you can actually connect with people through your music and you can actually see it. It just makes me feel really grateful. Just be organized and be kind to yourself. What makes you the most nervous about motherhood? That I hope I’m doing a good job. How did your life change after you had kids? Drastically. I didn’t expect to enjoyit so much though. I don’t get to work as much, but I’m enjoying spending time with Jarvey. I feel like it’s such a short period of time where he just needs me. But not having yourown time is definitely a big shock in the beginning. And even now, I’m learning every day that spending a day with him is a give and take. If I spend a lot of outside time with him, then he will give me a little time to practice on my own or let me make dinner. Miwa looking both elegant and comfortable in a beautiful lace vintage dress. How do you spend your moments of ‘me’ time? After Jarvey goes to sleep, if I don’t fall asleep with him, I ask my husband, “Can I have a half an hour just playing guitar?” Butsometimes you just need to catch up on your sleep, too, so it’s hard. Who are the people in your life or in the community that support you? It’s interesting because my husband James and I are both not from here. 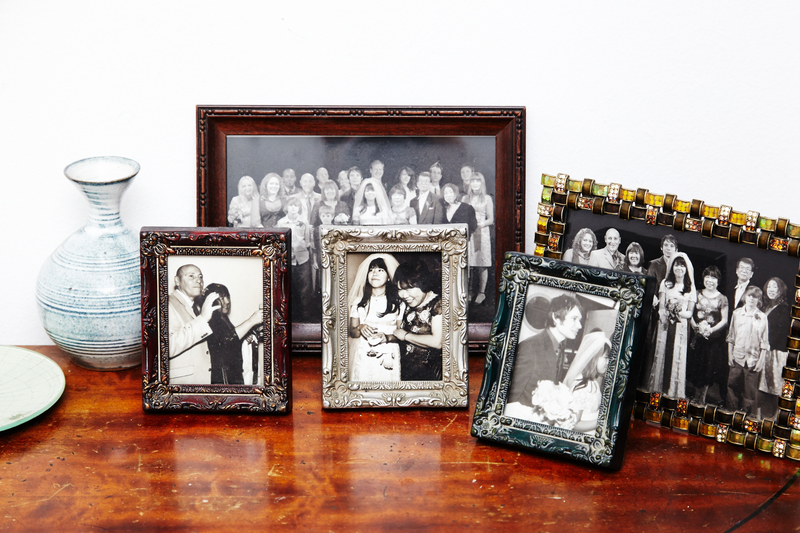 Our families are not here, so your friends become family. We wouldn’t be able to survive without them, for sure. I’m grateful for the fact that Jarvis actually gets to know them growing up. What kind of mom do you aspire to be? What did you learn about parenting from your mom that you have adopted with Jarvis? I felt like my mother, even though she was working full time, did everything and beyond. She baked cookies with us. She did crafts with us. When I came home, there was always a little handwritten note with a little drawing with our snack. She made dresses for my doll. She made dresses for me. And she did it without seeming to be putting too much effort into it. She just did it with almost a wave of a hand. I want to be like that, to be able to do the same for Jarvis. And do it with grace, hopefully. What did you decide not to adopt? I wouldn’t say that my mother was perfect, but she was a perfect mother to me. I really can’t think of anything that I would not do that she did. My friends and family inspire me, especially Jarvis. He’s so open and fearless, and I hope that that he keeps those qualities as he grows up. What are some of the differences between parenting styles in the US and Japan? In certain ways, kids in Japan have more independence. I see 8-year-olds riding around on a bicycle by themselves, and I’ve been in New York for so long that my heart stops, like “These kids are too small!” They have their independence and they have their freedom in certain ways, and I think that’s so wonderful. But the Japanese education system is very, very tough. You study hard. I think that can stifle creativity. In America, I feel like education promotes problem solving and creativity and critical thinking, and they are more open to different types of education. If your kid doesn’t do well in a structured environment, there is another way that they can thrive and learn. I think that’s very wonderful. 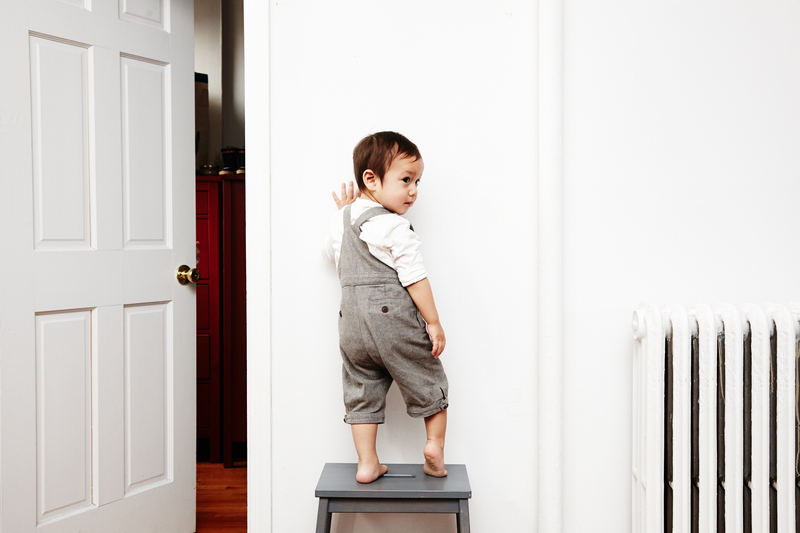 Jarvis taking center stage in a white babyGap button-down and overalls from Japan. What’s the most surprising cultural difference? The West is much more physically affectionate, not so much in Japan. When my parents met James’ parents, who are very openly physically affectionate, they were kind of like “Oh!” James’ mom gave my dad a hug and a kiss on the cheek, and my mom was like, “Oh, that’s his first kiss.” My parents, they never do that. Are you raising Jarvis to be biligual? Yes. I try to speak Japanese to him, but it’s hard when there are other people around. I can speak to him both in Japanese and English. Sometimes I just say it in Japanese and repeat it in English. Jarvis’ amazing book collection spans titles from all over the world. What’s your philosophy on fashion and style? I’m a dress girl. They’re so easy, you just put them on with a pair of cowboy boots and people say, “Oh, you are dressed up today!” I actually wear dresses exclusively. I try to only buy them in natural fabrics like linen, cotton, wool, or hemp that are hand-wash only, no dry cleaning. That’s my little contribution. And something that makes me happy. I want the clothes that I wear to make me happy. How has your style evolved since becoming a mom? I try to wear clothes that Jarvey cannot destroy. I used to wear primarily vintage but it’s really difficult for me now because those dresses are usually more fragile. I love to shop secondhand and I love Anthropologie. Their dresses are kind of unique, and they interest me. They have a little bit of a flair for vintage; maybe that’s why I like them. How many dresses do you own and how do you style them from season to season? I have too many to count! Most are them are secondhand that I’ve collected over the years. In the summer, I wear them alone with flats or sandals, and in the winter I pair them with tights, cowboy boots, and a cute cardigan. 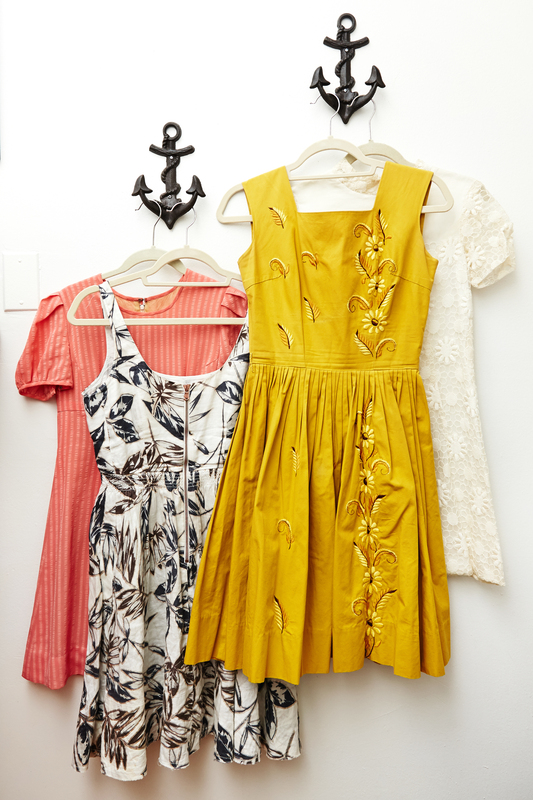 From left to right: Free People, J.Crew, Anthropologie and vintage. What’s your best example of how you try to live mindfully? I would love to make his clothes too, but I just don’t have the time. I usually make most of my own skincare products as well. And I try not to use plastics in our life. That is one of our goals. You can make a really simple detangler with apple cider vinegar and lavender oil, and it works wonders. Find more of Miwa’s secret recipes on the blog! Miwa and Jarvis enjoying a sweet treat at one of their favorite local hangouts.